Sail on the San Francisco Bay Sail aboard the Adventure Cat and experience the beauty of San Francisco from the water. These spacious catamarans take guests on a stable, safe ride combining the exhilaration of fresh air and waves on the deck with protection and outstanding views from the covered cabin. For an hour and half, you'll be treated to fantastic views of Alcatraz Island, the city skyline, the Golden Gate Bridge and the Pacific Ocean on the San Francisco Bay Sail aboard the Adventure Cat. Whether you're looking for something the whole family can enjoy or a romantic excursion for two, your sail on a Adventure Cat is sure to be a memorable highlight. See some of the Bay's most popular attractions up close as you sail around Alcatraz Island, cruise directly underneath the Golden Gate Bridge and head back admiring the city's famed skyline - it's quite a sight! Catch a glimpse of marine wildlife including pelicans, sea lions, dolphins, and even the occasional whale. 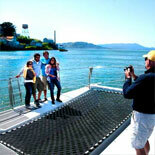 If adventure is your style, try out the deck trampolines (be warned, you may get wet!). The netting allows you the exhilarating feeling of having the waves rush under your feet, and are also extremely comfortable for lounging in the sun. Want a break from the wind? Come inside the protected cabin, have a seat and continue to enjoy the sights. Need a bite to eat? Snacks, soda, beer and wine are available for purchase at the cabin bar. These sailing catamarans give a uniquely stable and quiet ride without the noise of engines. You'll be amazed at the speed that wind in your sails can give you! 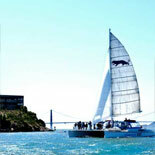 Pick up a helpful navigation guide providing information about San Francisco's landmarks as you sail past them. Feeling confidently sea-worthy? Take the helm from the captain and steer the boat (kids love this!). 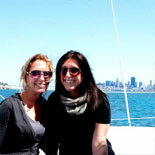 The captain and crew are always happy to snap a photo or answer your questions about San Francisco or the catamarans. 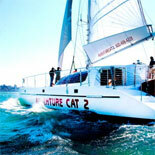 Make your reservations now and get your eTickets for the San Francisco Bay Sail aboard the Adventure Cat. This sailing excursion is consistently rated among the top five things to do in San Francisco, as thousands of happy guests can testify! This tour is seasonal and operates from Feb-Dec.
Feb 15-17: Sails Fri., Sat, and Sun at 1:00pm. 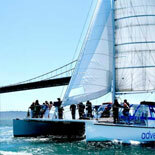 Mar 1 -May 24: Sails daily at 1:00 pm and 3:00pm. May 25 - Sep 2: Sails daily at 11:00am, 1:00pm and 3:00pm. Sept 3 -Nov 3: Sails daily at 1:00 pm and 3:00pm. Nov 4-Dec 1: Sails Fri., Sat, and Sun at 1:00pm. Arrive 30 minutes early to find parking and to locate departure point. Reservations are required in advance. Details on the eticket voucher. 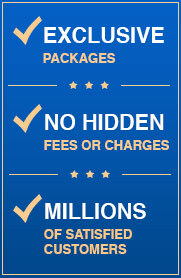 No Bay Cruises Oct 11-13 due to Fleet Week charters. Pier 39 Dock J San Francisco, CA. 94133. Gate J is next to the sea lions. Children 5 & under are free but they must be counted. Please confirm to reservations. 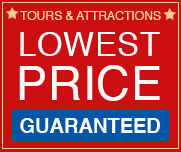 Reservations are required at least 48 hours in advance of desired tour. Directions from Pier 39 to Adventure Cat Sailing Charters: When you get to Pier 39, stand on the sidewalk & look toward the water, do NOT go down the center where the shops are, but take the left OUTSIDE walkway. Go toward the sea lions & look for a gate with the letter J on it. That's the dock.